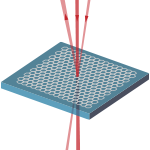 Authors: Suess, R. J.; Winnerl, S; Schneider, H.; Helm, M.; Berger, C.; de Heer, W. A.; Murphy, T. E.; Mittendorff, M.
Abstract: Understanding the optical response of graphene at terahertz frequencies is of critical importance for designing graphene-based devices that operate in this frequency range. Here we present a terahertz pump–probe measurement that simultaneously measures both the transmitted and reflected probe radiation from multilayer epitaxial graphene, allowing for an unambiguous determination of the pump-induced absorption change in the graphene layers. The photon energy in the experiment (30 meV) is on the order of the doping level in the graphene, which enables the exploration of the transition from interband to intraband processes, depending on the amount of pump-induced heating. Our findings establish the presence of a large, photoinduced reflection that contributes to the change in sign of the relative transmitted terahertz radiation, which can be purely positive or predominantly negative depending on the pump fluence, while the change in absorption is found to be negative at all fluences. We develop a hot carrier model that confirms the sign-reversible nature of the relative transmitted terahertz radiation through the graphene multilayer and determine that this behavior originates from either an absorption-bleached or reflection-dominated regime. The theoretical results are incorporated into a model utilizing an energy balance equation that reproduces the measured pump–probe data. These findings, which extend to mid- and far-infrared frequencies, show the importance of considering reflection in graphene–light interactions and have implications for the design of future terahertz photonic components.